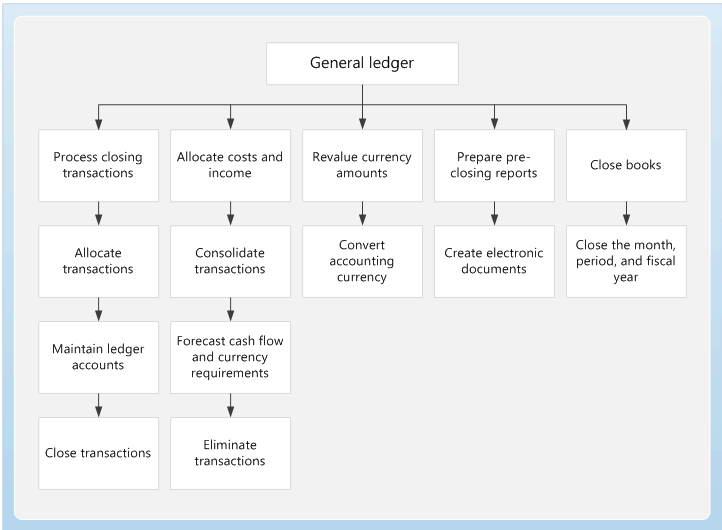 Use General ledger to define and manage the legal entity’s financial records. The general ledger is a register of debit and credit entries. These entries are classified using the accounts that are listed in a chart of accounts. You can allocate, or distribute, monetary amounts to one or more accounts or account and dimension combinations based on allocation rules. There are two types of allocations: fixed and variable. You can also settle transactions between ledger accounts and revalue currency amounts. At the end of a fiscal year, you must generate closing transactions and prepare your accounts for the next fiscal year. You can use the consolidation functionality to combine the financial results for several subsidiary legal entities into results for a single, consolidated organization. The subsidiaries can be in the same Microsoft Dynamics 365 for Finance and Operations database or in separate databases. Every company collects and pays taxes to various tax authorities. The rules and rates vary by country/region, state, county, and city. In addition, the rules must be updated periodically when tax authorities change their requirements. Sales tax codes contain the basic information about how much you collect and pay to the authorities. When you set up sales tax codes, you define the amounts or percentages that must be collected. You also define the various methods by which those amounts or percentages are applied to transaction amounts. The topics in this section provide information about how to set up sales tax codes for the methods and rates that your tax authorities require.